Live stream recording allows you to record your live stream and share it as a video on-demand (VOD). By keeping a record of your live events, you enable your your viewers to re-watch your videos whenever they like. Record your live stream for up to 8 continuous hours at a time. The feature’s button stays ON up to 7 days. Past 7 days, it can be turned back ON. 2- When you create a recorded file, your available storage will lessen according the size of the file (i.e. the length of the video). 3- Recording your stream will use some of your transcoding credits. 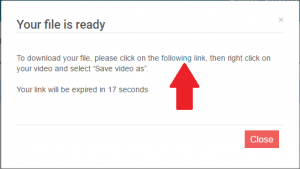 Your video recorded is automatically encoded. This process requires transcoding credits. read more Please note that if you don’t have enough transcoding credits, you won’t be able to watch the recorded file. To get access to live stream recording, just give us a call! How does live stream recording work? Please follow these requirements to ensure a successful recording. 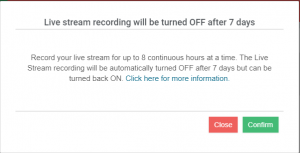 7- The Live Stream recording will be automatically turned OFF after 7 days but can be turned back ON. The Live Stream recording will be automatically turned OFF after 7 days but can be turned back ON. 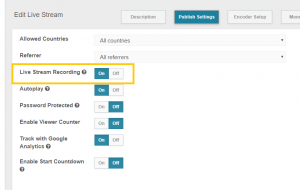 Please note that live stream recording is an automatic feature: once it is activated for a channel, the stream will record itself automatically each time you put it online, until 7 days after you have turned the feature ON. We recommend to launch your stream 10min before your event starts to make sure the recording catches all of it. If you do not want to wait 10min, you have the possibility to manually start the recording, please see below. You can easily verify the live channels for which you have enabled Live stream recording directly on your homepage. Indeed, if the feature is OFF, it will be displayed under the column “Recording” on your homepage. After turning ON the live stream recording control for your channel, please go back to the homepage or to your live channels section. 1- The record live icon is grey: this icon indicates that live stream recording is activated for this channel but that there is no on-going recording (because you have not started streaming on this channel yet). When passing your mouse over the grey record live icon, you will see a comment “waiting for the stream to start”. We recommend to launch your stream 10min before your event starts to make sure the recording catches all of it. The recording will stop after 8 hours, and start over automatically a couple of minutes later as long as your live is still ongoing. Note that you must also still be within the seven days period of time. Once your stream is online, don’t hesitate to refresh your homepage to verify if the recording has started correctly (i.e. if the record live icon becomes RED). Maximum length of a continuous recording: 8 hours. After this time, a new file will be automatically created. Therefore, if you are live streaming and recording for 16 hours for example, you will have 2 recorded files lasting 8 hours each. If you are doing a multi bit-rate stream, please note that the highest bit-rate will be recorded. Your recording will be automatically stop when you stop streaming. – You can verify that the recording has stopped by looking at the record live icon, which will have reverted to its initial color: grey. Please note that the longer your recorded file, the longer it takes to display in your VOD section. You can change the name of your video file by clicking on the title. The video of your recorded stream saves as an MP4 file, so there is no need to encode it. To download it, please click on the green icon framed in red in the screenshot above. The following pop-up will appear asking you to click on the following link. Please click on “The following link”, your file will open itself in a new window. Please note that live stream recording allows you to download the same file only 5 times per 24 hours. Please note that a recorded stream has the same exact features as a classic VOD: geo restriction, referrer restriction, free embedding, paywall options, etc. Make sure you turn your video ON before sharing it. 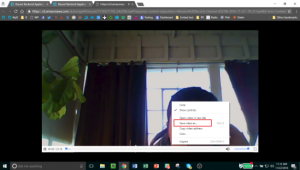 Any issue with your live recording file? Article states that we can manually start a recording if needed, then further states that the method to do so is below. However, I cannot seem to find the instructions for manually starting of a recording. Am I missing something? you are actually right, it seems that we are missing one piece of information here. So for your question, I would suggest you enable the auto recording anytime you want to start your live. That would be like a manual recording. Did you have any need in particular that would need another recording feature?